Cincinnati Bell has been around for 140 years and throughout all this time, we have been proud to call Cincinnati and this community our home. Cincinnati Bell believes in the values of Humility, Inclusion, and Integrity and the fundamentals of Simplicity, Collaboration, and Speed.You might be wondering, what has Cincinnati Bell been up to? Well, let me tell you. In 2018, Cincinnati Bell has logged 10,000+ volunteer hours and raised over 1,000,000 dollars for various charities including The United Way, The American Heart Association, and the American Red Cross. We are constantly working within and giving back to the community in order to make a substantial and sustainable difference in areas that support the growth of our beloved home, Cincinnati. We couldn’t be more proud of that. Last year, we sponsored the Cincinnati Street car, which has continued to connect our downtown area. You are now able to hop on and off any of the 18 stops including Fountain Square, Washington Park, Music Hall, and 18 other downtown stops. Within our company, we have created Employee Resource Groups (ERG) to connect and support our employees. 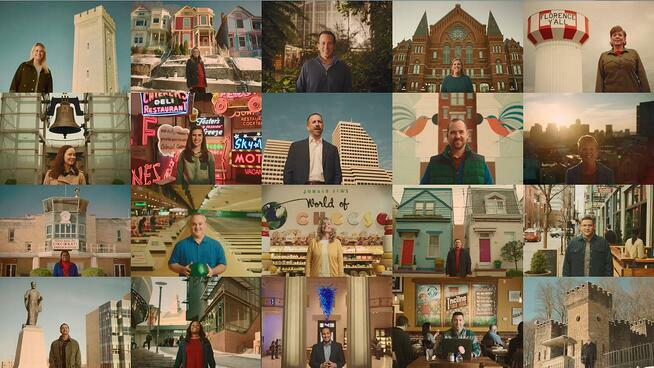 At Cincinnati Bell we believe in the transformative power of connectivity, and we believe connections are made stronger when we embrace the diversity in our employees, customers, and shareholders. These groups were made in accordance with our company values and commit to employ diversity and inclusion efforts. Right now, we have six EGG’s including: Cincinnati Bell Young Professionals, Arrow (Advancing Resources and Representation of Women), Veterans of Cincinnati Bell, ACE (Asian Champion Employees), Pride, BOLD (Black Organization for Leadership Development), and c.b.g.g.i (Cincinnati Bell Go Green Initiative) and Conexión. These groups also do their part to give back to our community by volunteering, donating, and educating others on their specific causes. In 2018, Connect Cincinnati has been connecting the Cincinnati area with our largest number of free Wi-Fi hotspots all over Cincinnati. Connect Cincinnati aligns with Cincinnati’s efforts to advance the city’s trend of growth, development and innovation. Cincinnati Bell has invested time, money, and manpower to bring Gigabit Internet speed, Wi-Fi infrastructure, and this mobile app to tie technology directly to this community. We love our hometown. We love it so much that we have made multiple shirts expressing our love for our city. Not to mention, they support local charities AND show off our pride we have for the place we call home. This year our new #CincyGive shirt is celebrating the Arts! All of the proceeds generated will go to the ArtsWave Foundation. Join in with Cincinnati Bell to support ArtsWave to make Cincinnati a beautiful place to live. You can make a difference by joining us for an upcoming event, purchasing an auction item, calendar, prints, or by simply making a donation. All of the proceeds will go to the 2019 ArtsWave Campaign.